Revenue in the Consumer Electronics segment amounts to US$614m in 2019. Revenue is expected to show an annual growth rate (CAGR 2019-2023) of 7.9%, resulting in a market volume of US$830m by 2023. User penetration is 41.7% in 2019 and is expected to hit 55.1% by 2023. The average revenue per user (ARPU) currently amounts to US$264.40. In global comparison, most revenue is generated in China (US$127,269m in 2019). The eCommerce market segment Consumer electronics includes the online sale of consumer electronics, for example, radios, TV sets, MP3 players, stereo systems and DVD players. Furthermore, the segment also includes hardware derived from the field of communications electronics, e.g. desktop computers, laptops, tablets and smartphones. Well-known and important online shops that focus on these types of equipment are bestbuy.com and amazon.com. All monetary figures refer to the annual gross revenue and do not factor in shipping costs. Reading Support Revenue in the Consumer Electronics segment amounts to US$614m in 2019. 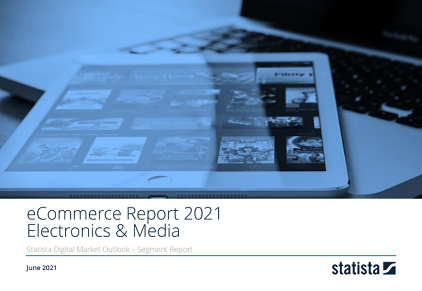 Reading Support The Consumer Electronics segment is expected to show a revenue growth of 10.2% in 2020. Reading Support In the Consumer Electronics segment, the number of users is expected to amount to 3.1m by 2023. Reading Support User penetration in the Consumer Electronics segment is at 41.7% in 2019. Reading Support The average revenue per user (ARPU) in the Consumer Electronics segment amounts to US$264.40 in 2019. The following boxes show the top 5 online stores by eCommerce net sales (first party sales) in the Consumer Electronics segment in Finland. Data basis for net sales and market share are company surveys, annual reports and a complex sales forecast model developed by Statista. Reading Support In the year 2017 a share of 26.4% of users is 35-44 years old. Reading Support In the year 2017 a share of 66.1% of users is male. Reading Support In the year 2017 a share of 40.9% of users is in the high income group. Reading Support With a market volume of US$127,269m in 2019, most revenue is generated in China. Reading Support With a rate of 45.3%, the user penetration in the Consumer Electronics segment is highest in Brazil.